As an educator and a parent, one of the perennial dilemmas I have faced is how to discipline our modern day kids. 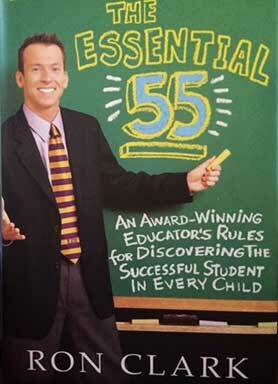 I found a solution to this dilemma in the form of a book, The Essential 55 by Ron Clark. Ron Clark is a teacher in the US since 1995. He is supposed to have taught in some of the most difficult schools in the country. He won the prestigious 2001 Disney Teacher of the Year Award for the way he has brought about transformation in his students. In the book, Clark lists a set of 55 rules for students to follow, which he feels are essential to running a productive classroom. The rules encompass many issues from manners, disciplinary issues, homework policy, proper test procedures, and even to activities outside of the classroom like behaviour on fieldtrips. Many of Clark’s rules are rules of conduct and courtesy, like simply saying thank you when a favour is done. Clark’s rules are meant to create behavioural habits that students can retain for the rest of their lives. Rule 1: When responding to any adult, you must answer by saying “yes ma’am” or “No sir”. Just nodding your head or saying any other form of yes or no is not acceptable. We may not agree with all that Clark proposes, but the book could be a starting point for discussions. School heads can facilitate the book’s review as a part of their meeting with their teachers. The school team can then come up with their Essential Rules and implementation policies. Teachers can refer to the book as a guide for developing ideal student-teacher relationship. The possible challenge that we meet while advocating these rules is whether we as adults are ready to follow them ourselves. Also, some of the etiquette may seem too western to follow. However, I believe we are preparing today’s generations to become global citizens. Even if some of the rules seem too much right now, in the long run our children will be thankful to us. The rules in the book will surely increase their confidence while interacting with others at universities or work places. So go ahead and gift this book ‘The Essential 55’ to yourself, your fellow teachers, or parents you know. The author is an experienced Educator from Mumbai currently based in Hong Kong. She is engaged in observing educational scenario in international context. She can be reached at shamim.suryavanshi@gmail.com. Note: This book is available on popular online stores Amazon and Flipkart.